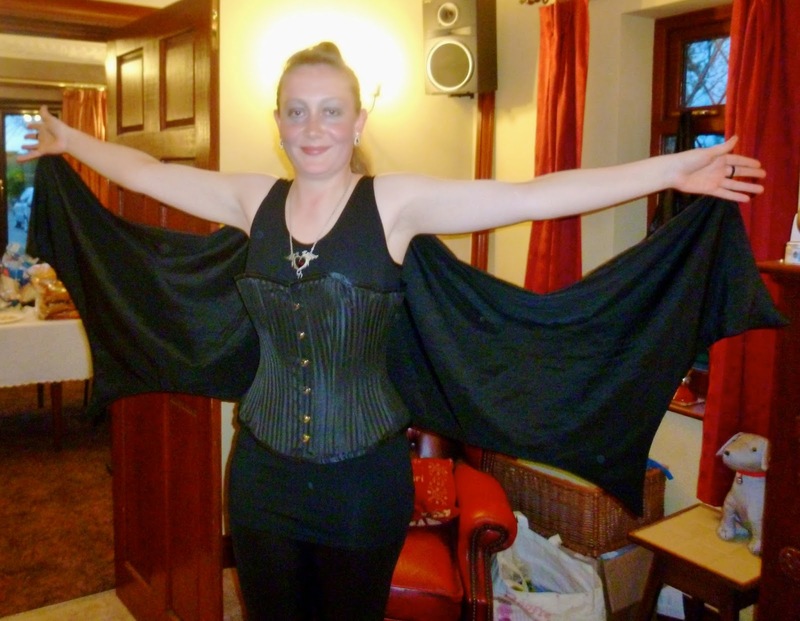 D.I.Y Fashion: Dragon Wings - CounterCultural. CounterCouture. Due to my dislike of convention and social awkwardness, I decided that appearing as Daenerys, Cersei or Sansa would be boringly popular. So I decided that I would go as Arya Stark or Brienne of Tarth. Then, while wishing I could find an excuse to wear my dragon necklace, I had a lightbulb moment… I would go as one of Daenerys’ dragons! As black was going to be the easiest colour to source for each piece, I chose to go as Drogon. So the fun began. First of all I ordered faux-leather leggings and a vest top in black from Amazon before turning my attention to the wings. As they would be the most dragon-like part of outfit, they needed to be right. So I headed to our local fabric/sewing shop with my mum, where we sourced black material and cotton thread. Once that was all sorted, the measuring began as I stood with my arms outstretched while my mum pinned the fabric at the correct point. Once pinning the cloth to find the correct arm span, I set about creating a wing template (while watching Avengers Assemble). Such a cool kid, making a wing template while watching Avengers Assemble. I stuck twelve sheets of A4 white paper together with masking tape. This created a large enough space to draw (and re-draw) a template. D.I.Y. compass using ribbon, a pin and a pencil. After several failed attempts at freehand drawing, I created a compass to draw a decent curve (above image). By drawing a curve that took up half the space, I had my basic wing shape to work with. I then used the compass to draw three smaller curves, within the larger curve, to create points (below image). The first small curve has been cut out. You can see where the first point will be. Having drawn out my template, I proceeded to cut out my template (below). At this point, I realised that my template was now not quite long enough the reach the end of my arm. Oooh, plenty of spare fabric to play with. Fortunately, when I pinned the template to the fabric, I discovered I had a lot of spare fabric to play with. So I consulted the sewing oracle who is my mum, who sensibly suggested that I move my template along so that the spare fabric was across my back. My cut out wings, with extra fabric to go across the back. I then proceeded to draw round the template in tailors chalk, to create a round seam allowance to cut along, extending the line straight across the ‘back fabric’. It is one advantage of using black fabric, as the chalk showed up really clearly (see above). Once the wings had been cut out, I began to tack the two sides together. (I had folded the fabric in half to create a sturdier shape.) Unfortunately, this wasn’t without accidents. I managed to stupidly catch a piece of loose skin with the needle. It wasn’t much but the smallest scratches always seem to sting the most. Tacking the two sides together. The chalk did make a straight line a lot easier. The pesky little scratch from catching a needle. Can’t believe how much it stung! After I tacked the two sides together, I was all set to do the final stitching on the sewing machine. There was only one problem… I’m useless with sewing machines and trying to thread the bobbin proved a task beyond me. So guess who saved the day… Yes, I came home from Morrisons to discover my mum sewing my wings up. Then all I had to do was turn them inside out, use a wooden spoon to make sure the points were fully poked, and Mum sewed up the gap and a dart down the middle. All I had left to do was attach the wings to my top and elastic bands. As I plan on reusing the black vest top- who doesn’t need a decent black vest- I only tacked the wings along the neck and shoulders. The elastic bands were two small hairbands that I secured on to the uppermost wing points so my arms became part of the wings. And with that my wings were finished and I could begin to pack! The finished wings attached to the top. They could double up for Batgirl too. So on 5 April I headed off to Fee’s for our Game of Thrones party. My finished outfit consisted of winged top (long enough to cover my behind), corset, faux-leather leggings, new heels and dragon necklace. I finished it off with a quiff, high ponytail and OTT make up. I matched the red lippie with the dragon heart but I may have over done it on the silver eyeshadow… Then again, going as a dragon was probably OTT anyway. The final outfit. Do I make a passable dragon?